Are You Tracking Calls? You Should! 73 Billion phone calls are generated from mobile search alone. If you aren’t tracking those calls, you’re losing attribution for your marketing channels. Most of our clients have call tracking in place, do you? If not, we can help! Ah, St. Patrick’s Day…A day to drink a minty shake, wear a shirt that says “Kiss Me I’m Irish” even if you’re not, and a day to look for the infamous 4 leaf clover. Has anyone ever found one? We’re not sure. One thing we are sure of is Digital Marketing. And we’re sure this holiday is a great day to spend the green, to make the green! We’d LOVE to help you out if you need it! Just let us know. This is the seventh post in an 8-part series on how to rank your business for local searches at Google. Previously, I’ve listed the most important aspects that influence your local ranking, discussed how to get the most out of Google My Business, covered best practices for on-site optimization. I’ve also given you some ideas for building inbound links and how to build citations and explained the importance of reviews. Here, I’ll focus on what impact social signals have on local results (if any). James is speaking on Wednesday, March 14th in the session “Conversion Optimization: Turning Quick Wins Into Winning Streaks “. The Engage Conference is a one-day digital marketing conference in Portland Oregon, presenting multiple informative learning tracks and panel sessions. Tony Svoboda is the Treasurer for SEMPDX and the rest of the WebRanking crew will be in attendance. Use Promotional Code “SVOBODA” for $100 off non-member tickets. James Svoboda is the acting Vice President for MnSearch and the rest of the WebRanking crew will definitely be there. Pre-Keynote Registration is open now. Save big by registering early! We started working with the team at Hand & Stone in Burlington in 2013. 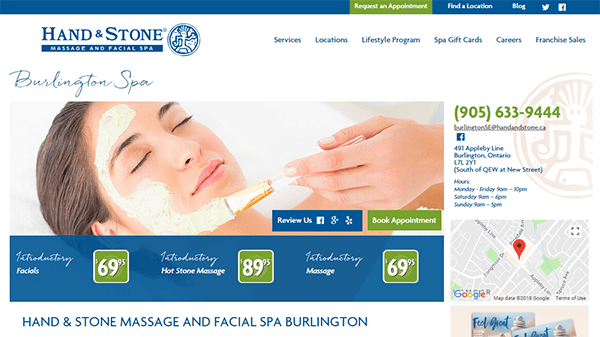 We work with them offering expertise in Google AdWords campaign development and management to drive quality visitors looking for massage and spa services in Burlington CA. Hand & Stone Massage and Facial Spa offers Registered Massage, Facials and Waxing services. If you’re in the area check them out.